Mirabito Energy Products is looking for full time qualified CDL A or B driver’s license with Tank and HazMat endorsements. Mirabito Energy Products is a 3rd generation family owned and operated company with 90 years of experience. We are a customer oriented company that provides unparalleled customer service. Safe delivery of heating oil, diesel and propane. CDL class A or B with clean driving record with tank and HazMat endorsements. Must meet all DOT requirements including road test, physical and drug screen. OUR PEOPLE MAKE ENERGY DIFFERENT! What Hazmat Training Courses Do I Need? 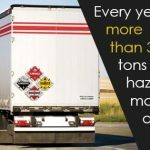 Hazmat School provides online hazardous waste, hazardous materials, and safety training to fully comply with OSHA and DOT requirements. We provide official OSHA and DOT certificates. We serve more than 20,000 students each year. © Copyright 2019 Hazmat School. All rights reserved. A subsidiary of Safety Compliance Management, Inc. Please send us an email and we will get back to you as soon as possible!